What's the most difficult thing you did in the last year? Now stop. Before you answer, can it compare to creating a full-fledged indie game—slated to be approved on Steam—created entirely with QBASIC? Probably not. You get the idea after about 45 seconds. Now, over 20 years later—but with the exact same programming tools—we have Black Annex. Check out this trailer with actual gameplay—and I can't say it enough—using the same programming language that the above video was "showing off." Not only are the simple visuals awesome, but the gameplay actually looks complex and tough to master—not something you'd expect from a programming language with simple loops and statements. 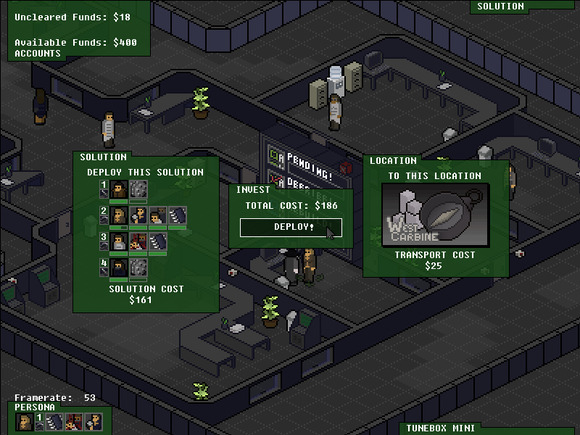 It's an isometric corporate sabotage and infiltration game. What that means exactly I'm not sure but you can choose your own playstyle and outfit agents to "steal, destroy, kidnap and kill" as you wish. I didn't want to 'learn' how to make a game—I realized I already knew how to make a game. I just had to go back to the tools I knew. But why QBASIC when there are so many other powerful tools out there that would probably be simpler to use? Lance McDonald, the game's creator, hearkened back to when he made games as a kid with QBASIC and wanted to make a love letter to the great games of the '90s. "When I sat down to make Black Annex a year ago, I didn't want to 'learn' how to make a game—I realized I already knew how to make a game. I just had to go back to the tools I knew" McDonald said. He also mentioned that he mailed a QBASIC game to Epic MegaGames when he was 9 and never heard back. He had something to prove. 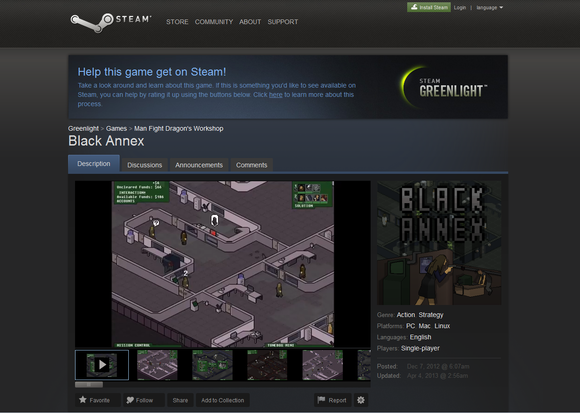 Black Annex's Steam Greenlight page. Black Annex was just announced last week and has already gained a lot of steam (pun intended) on Steam's Greenlight program, where users can vote on smaller games they'd like to see made available for purchase on the Steam platform. "It would be amazing for the game development community," said McDonald when asked about Black Annex's potential ascension to Steam. "It would show that even old, abandoned tools and the most basic pieces of software can still be put in the hands of someone who wants to create their dream and result in beautiful things happening." Black Annex requires at least a 2.6GHz processor due to the scope of the project and the unoptimized multi-dimensional arrays. The game is a 12000 line .bas (BASIC) file. Yeesh!